Whole30 Roasted Apple Bacon Brussels Sprouts. Otherwise known as your new favourite vegetable dish. These Whole30 Roasted Apple Bacon Brussels Sprouts are the perfect combination of sweet and salty goodness. Serve these Whole30 Roasted Apple Bacon Brussels sprouts at your next event and everyone will thank you. Happy Monday! And it’s an especially happy Monday because it’s a long weekend. To help you celebrate your extra day off I am bringing you a dish that people have been begging me for for months! I posted these Whole30 Roasted Apple Bacon Brussels Sprouts on Instagram a few months ago and had so many requests for the recipe. Well friends, I am finally getting around to sharing it with you. These long awaited Whole30 Roasted Apple Bacon Brussels Sprouts are a total hit in my house. They never last long in the fridge, and even make delicious left-overs. So the royal wedding happened over the weekend. Did you watch? I did not. I really don’t understand what all the hype was about to be honest. I mean it’s just a wedding. Yes a royal wedding, but still just a wedding. But for those of you who did watch, what did you think? Did it meet your expectations? Did you like Meghan’s dress? Or dresses I should say? I was a little unimpressed I must admit. I realize it must be pretty formal since it is the royal wedding, but I found them both to be rather boring, and not that well fitting. I expected something a little more special from someone like Meghan who is such a fashion influencer. But I am guessing there are some strict rules that must be followed when it comes to designing a royal wedding gown. Because if there is anything that I do know about royalty is that there seems to be rules for everything. Absolutely everything. At least that is what watching The Crown has taught me. And ps. if you haven’t watched that show on Netflix yet you need to. Yes NEED to. It is so, so good! But man, what a terrible life that would be. Why anyone would choose to marry into the royal family is beyond me. Constantly being scrutinized, told what to do, how to act etc. It would be suffocating! I realize it is also a huge honour but it definitely wouldn’t be for me. Not one bit. Now, let’s talk food. Do you like Brussels sprouts? I find that people are either lovers or haters of this vegetable. I am definitely a lover. Such a lover! I have a couple other dishes on the blog dedicated to this vegetable including my Maple Cranberry Brussels Sprouts. I badly need to update the photos of the Sautéed Beef and Brussels Sprouts but for a long time that was the most popular recipe on the blog. Until my food photography got better that is. It really is a delicious dish I promise. Don’t let my crummy old photos fool you. 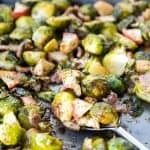 I have given you a few different ways to make these Whole30 Roasted Apple Bacon Brussels Sprouts to make them compliant with whatever special diet you are following. Whether it be the paleo diet, AIP diet, GAPS diet or SCD diet you can make this recipe work for you. Because there is nothing worse than finding a recipe you think looks amazing, only to discover that you can’t have it. Trust me I have been there too many times. Since it has become more and more popular, I have been trying to post more Whole30 compliant recipes for you lately. If you haven’t downloaded it yet, I actually have an entire FREE ebook of the most popular Whole30 recipes on the blog. If you aren’t yet familiar with the Whole30 diet and program, this book outlines it all for you. If people are looking to start a whole foods based diet, I often refer them to the Whole30 program because everything is so easily outlined in all of their books. The Whole30 and paleo diets are extremely similar. One main difference is that the Whole30 doesn’t allow any form of sugar during the 30 day period, or any kind of treat or dessert. Doing a Whole30 is a great way to re-program your taste buds and easily transition to a real foods based way of eating. 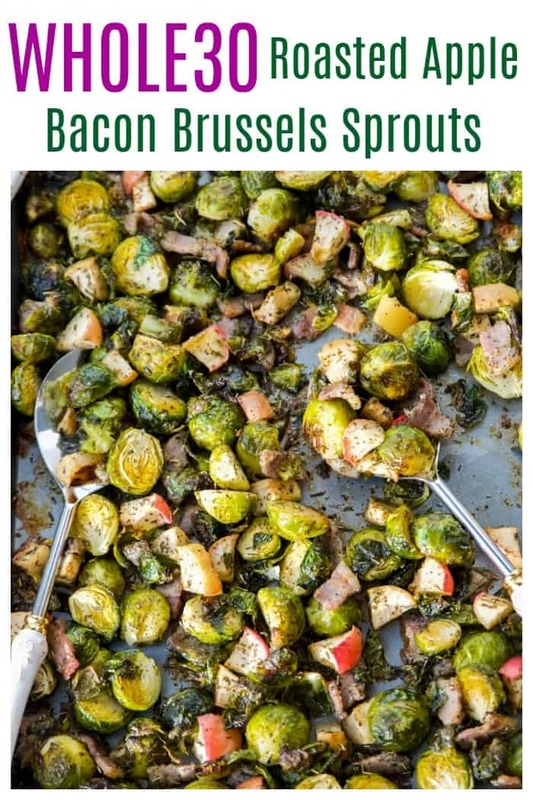 If you make these Whole30 Roasted Apple Bacon Brussels Sprouts I would love to know what you think of them. You can leave your comments at the bottom of the post. I really do love hearing from you guys! PS. Did you guys know that I am also on Facebook and Instagram? I often share things on those platforms that I don’t share here so make sure you are following along!